With sleek, modern styling, Brother’s NEW Innov-is models combine high levels of functionality with increadible ease of use. 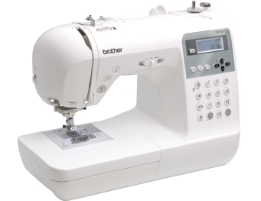 The Innov-is 55 is feature packed with 135 built-in stitches including 10 buttonholes and lettering for monograms, labels and decorative effects. Combine stitch patterns and save to memory, repeat patterns and even create mirror images of stitches via the easy to use keypad.